This first lot is a (Sympathie X R. virginiana) X R.carolina. There are three variations of this cross. Type 1 has prickles only at the leaf joint/bud. Type 2 is thornless while Type 3 has low compact growth. Hi Warren, to my eye I like "type 2", can you explain if possible why R.virginiana has the influence ? 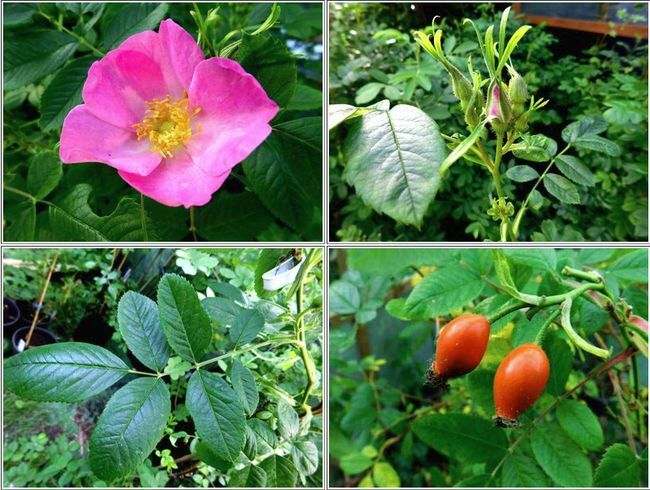 This seedling is a cross of Rosa virginiana x Quatre Saisons. The Rose has a strong Fragrance, is fertil and blooming until autumn. This is a seedling from last year Wendy X (Valkeeri X [Charles Austin X ( Mimas X R.virginiana)]. It has a very quick repeat. Looks to be fairly compact too? That would be especially nice, but either way, I like it Warren! Thanks Tom, the Wendy X (Valkeeri X [Charles Austin X ( Mimas X R.virginiana)] is even more compact than the pollinator. A Hybrid virginiana/ Hybrid Musk. My f1 virginianas send out rampaging suckers regardless of the cross. I'm wondering how many generations removed from the species you have managed and whether that propensity to sucker remains in them? I agree some of the F1's do send out suckers, the worst was a F1 (Sympathy X R.virginiana) which I pollinated with itself to form an inbreed line. This one has been the worst in suckering. After two generations away from R.virginiana this habit seems to stop. Those which I have bred with R.virginiana represented on both sides of the parentage, show no suckering. Seedling S5 T140 Type 1. The growth structure is completely different from that of S5 T140 Type 2. This seedling stands at a height of 100cm/ 3ft. Very fun blossom on that last one, Warren, and some very nice seedlings all around. Is the last one a mature form, or one of the earlier blossoms? You have some very impressive seedlings to show for your work, and as someone with limited resources (time and land) I am curious, if you don't mind my asking, how many seeds do you process/plant per year, and how much acreage/hectares do you have for growing on your seedlings? Not to be indiscreet in my queries, but I am often impressed by the prolific breeding of others and sometimes feel I have comparably limited potential. Several very nice looking seedlings across your recent posts, and I'm happy to vicariously share in your successes! Thank you for that! thank you. This is a 2017 seedling which has flowered multiple times already. I sow up to 1000 seeds per season, but sometimes less and all are grown out in a double house block at home. I cull all that have PM or have lack of vigour, around Summer I have the second cull, which maybe those seedlings which may develop BS and again lack of vigour. Do not think that you have limited potential? the secret is to secure multiple breeding lines which you can totally rely on for future success. I have a good idea what results I get from the breeding lines I have developed. A Virginiana Hybrid seedling for this year. Seedling S43 T42 :-[ Westerland X [Charles Austin X (Mimas X R.virginiana)]] X Bamako. Foliage is very clean, plant compact and bushy. These are the offspring of seed parent S7 (Sympathie X R.virginiana) single bright red bloom. Seedlings S7 T170:- (Sympathie X R.virginiana) X a seedling of [(R.calocarpa X R.nutkana) X R.acicularis] Narrow leaf glossy form.